Bruno Jetin is Associate Professor at the Institute of Asian Studies, UBD. 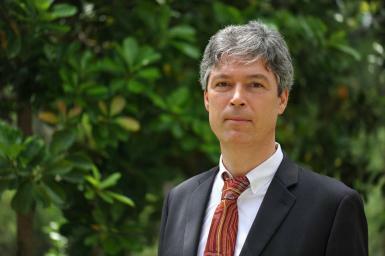 Prior to joining UBB, he was researcher at the Institute for Research on Contemporary Southeast Asia (IRASEC, CNRS-MAEE, Bangkok) and Associate Professor at the University of Paris 13 Sorbonne Paris Cité where he was Deputy Director and then Acting Director (2010-2012) of the Research Center in Economics. He holds a PhD in economics from the University of Paris 13 Sorbonne Paris Cité. His current work focus on income distribution, growth, poverty and inequality, and wellbeing in East and Southeast Asia. He is also an expert of the automobile industry. He has published many articles and chapter books for instance: B. Jetin and M. Mikic (editors), “ASEAN Economic community: a model for Asia-wide Integration?” (PalgraveMcMillan, 2016); B. Jetin (editor, 2015) « Global Automobile Demand. Vol.1: major trends in mature economies”. Vol. 2: Major trends in emerging economies”, Palgrave McMillan; B. Jetin, “Distribution of income, labour productivity and competitiveness: Is the Thai labour regime sustainable?” Cambridge Journal of Economics, 2012, vol. 36, 4. 1985. Master Degree in “International and Financial Economics”, University of Paris 13. Master Dissertation on “Labour force management in South Korea”. 1982. Bachelor Degree in Economics, University of Paris 13. Production networks of the Asian automobile industry: Regional or global? The US automobile market after the "great recession": Back to business as usual or birth of a new industry? The us automobile market after the “great recession”: Back to business as usual or birth of a new industry? Distribution of income, labour productivity and competitiveness: Is the Thai labour regime sustainable? Strategies of internationalisation of automobile firms in the new century: A new leap forward? B. Jetin and Julien Chaisse (2018). “International Investment Policy for small states: The case of Brunei”. In J. Chaisse and L. Nottage, (editors): “International Investment Treaties and Arbitration across Asia”. Leiden, Boston, Brill Editors. B. Jetin (2018). “One Belt-One Road Initiative and ASEAN Connectivity: Synergy Issues and Potentialities”. In B.R. Deepak (editor): “China’s Global Rebalancing and the New Silk Road”. Springer, Singapore. B. Jetin (2018). “Middle classes in Southeast Asia: Between Democracy and Authoritarianism” (in French). In A. Pesses and C. Thi-Liên Tran (editors): “Southeast Asia 2018”, Paris and Bangkok, Les Indes savantes-IRASEC. B. Jetin and O. Ekin Kurt (2016). “Functional income distribution and growth in Thailand: a post Keynesian econometric analysis”. Journal of Post Keynesian Economics, vol. 39, no. 3, p 334-360. B. Jetin (2015). “The US automobile market before and after the “Great Recession”: back to business as usual or birth of a new industry? In B. Jetin (editor). « Global Automobile Demand. Vol.1: major trends in mature economies”. B. Jetin, M. Mikic (editors, 2016). “ASEAN Economic Community 2015: A model for Asia-wide regional integration?” Palgrave McMillan, Basingstoke and New York: Palgrave Macmillan.